Mats Bergström and Johan Liljedahl (electric and acoustic guitars), Svante Henryson (electric bass guitar), Jonas Östholm (piano), Magnus Persson (drums and mallet instruments) and Edda Magnason (piano and vocals). 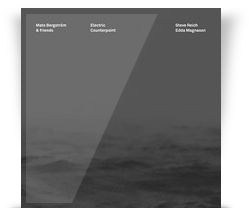 Music by Steve Reich and Edda Magnason. Mats Bergström Musik AB MBCDBD 01. Box containing CD and Blu-ray Disc.